kinder eggs are a scam! past saturday i went to the migros to buy some stuff for my weekend. and just because we had acute chocolate craving, nina and me bought two kinder eggs at the checkout. when i opened mine back home, i was quite stunned that there was a little car in it (which is not really stunning per se). the car was a smart forfour which consisted of four parts, so it was not even a challenge to put the thing together. since when do they put advertisement into chocolate? but the best thing comes now: when nina opened her egg, she had exactly the same thing in it. what a scam! not only do they put paid advertisment into the eggs (see image), they also flood you with it. next time we’re gonna buy real chocolate. Hey, it’s been like that for at least ten years! As long as I’ve been buying kinder eggs for my kids there has very frequently been merchandising articles in them; movie figures mostly, but also other stuff. 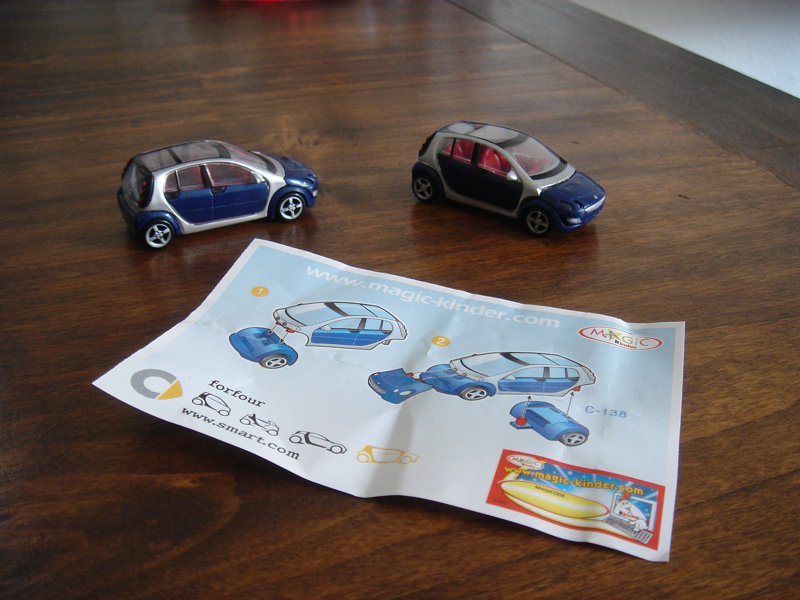 In a kinder egg I bought recently there was a smart fortwo coupe, it’s actually a very cute little car! And thanks to the transparent roof and windows, I can see all the little details. But I guess it’s a surprise if you didn’t know they put little merchandising gimmicks in those eggs.